As the owner of a commercial building that you use for your own business or rent to another company, you know the dangers of a leaking roof. Even the smallest of leaks can cause water damage inside the walls, attract mold and lead to structural damage. Though you might think that all commercial buildings have the same flat roof, most actually have a slightly peaked roof that allows water to roll off and down the sides of the building. No matter what roof type your building has, you can pick different membranes for added protection. The most common roofing membrane is one made from rubber. While this is also the cheapest choice, it generally will not last as long as the other membrane types do. 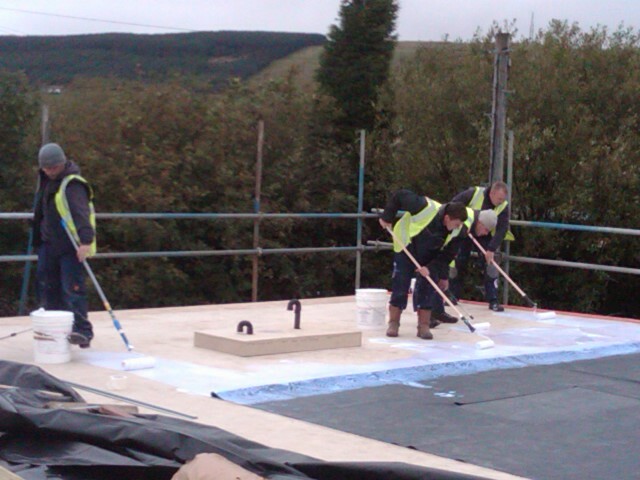 The rubber often comes in individual sheets that the roofer lays down on the roof and secures in place with solvents. A similar membrane is something called a modified membrane. Roofers will place a layer of rubber material on the roof, put solvents and adhesives on top, add a layer of more rubber and keep building up the layers to reach a specific height. A heat membrane, also called a thermoplastic membrane, is one that uses a type of synthetic rubber. When the manufacturer makes this membrane, the company uses heat to weld the seams on the pieces together. This heat essentially melts the pieces together and ensures that the membrane will not come loose due to high temperatures or certain weather conditions. Though heat membranes are more expensive, most last longer than standard rubber membranes do. Another option for commercial buildings owners is an EDPM membrane. The name comes from the two primary materials used in the construction of the membrane. One benefit of choosing an EDPM roof is that you can get the pieces of the membrane cut to the specific size of your roof, which makes installation easier. Roofers will usually carry large rolls of the membrane up to the roof, lay the rolls flat on the roof and then use sealants to secure the membrane to the roof. They can use long rollers to ensure that each piece gets the right amount of sealant. Whether you opt for EDPM roofing installation, a heat membrane or one of the cheaper rubber membranes, you can keep your commercial building free from leaks.